We typically train new persons to fly every Tuesday evening weather permitting. Training starts in April. It occurs from 6:00 PM until dark, during daylight savings time months. This is on an instructor permitting basis. To insure we are training on a particular evening or for more information: click here to contact the training co-ordinator. The Hawks operate under the guidelines of the Academy of Model Aeronautics (AMA) and the by laws of the Hawks. An individual that does not belong to the Hawks and / or AMA is still welcome to join us as a guest. We offer a 60 day introductory including 3 flying sessions with an instructor prior to joining the Hawks and AMA. The individual can then move forward and become a member of the Hawks Club and AMA if they choose. Almost anyone can learn to fly a radio controlled model aircraft, with the help of a competent flight instructor. This article is intended as a guide to help the student understand the steps necessary to learn the art of flying a radio-controlled airplane. By providing a somewhat standardized curriculum and an experienced instructor the solo pilot will achieve all the necessary understanding and skills to be able to safely fly a radio-controlled airplane at a busy model field. Please donate and help the Hawks pay for this new runway repair. This maintenance is the Hawks burden and has cost us thousands of dollars. Would you please make a donation to help out? The amount is up to you. Your asistance will reduce the significant impact on the club treasury. Please use this PayPal "Donate" button to assist us today. You do not need a PayPal account. Most any credit / debit card can be used. Please donate today! The HAWKS radio control club is located at 252 Joe Nuxhall Way in Hamilton, Ohio 45015. Please find the map link at the top right. We are an organization of dedicated model aircraft enthusiasts. We fly all sizes and types of RC planes and helicopters. We also teach newcomers to fly! We were formed in the fall of 1977. Bob Smorey was the club founder and its first elected president in 1978. The HAWKS currently administers a field on the City of Hamilton Waste Water Treatment Department of 17 acres and shares a 200 acre grassland set aside for wildlife and bird watching. 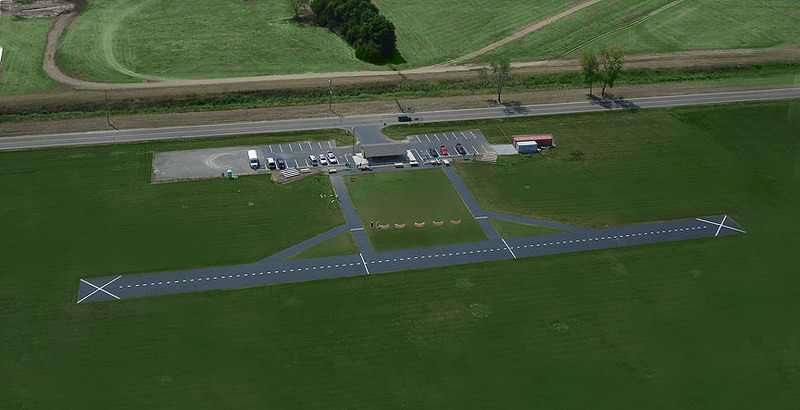 The HAWKS have also administered several flying sites within Joyce Park and currently run our new facility (created in 2005) on Joe Nuxhall Way that boasts a 550' by 30' paved runway and taxiways. Come on out and fly with us! The next club meeting is May 1, 2019 7:30 PM at the field. Want something on the calendar? Contact the webmaster.